A case study of building an online polling system with PHP and mySQL. In your travels across the Web, you've probably seen (maybe even participated in) online polls, quick measurements of what visitors to a site think of the hot-button issues of the day. And back when portals where a Good Thing, online polls appeared on each and every one of them; they were - and still are - a simple and effective method of promoting a sense of community amongst the visitors to a Web site, and of generating demographic data on a site's visitors. Building an online poll isn't very hard; as a matter of fact, with a middling knowledge of PHP, you can slap one together in a couple of hours. And you won't even need a degree in rocket science to accomplish this feat - PHP makes it so easy to build and maintain a Web application like this that you'll wonder why you never did it before. Over the next few pages, I'm going to demonstrate this by showing you how to build a simple polling system, one which you can quickly integrate into your own Web site. And if you're new to PHP, the process should also offer some insight into how to apply PHP's capabilities to a real-world problem, and create a simple and elegant solution. The first order of business is to decide the features to be supported by this application. Obviously, there needs to be a mechanism by which the user can view a question, and then select from a list of possible answers. Once the "vote" has been captured, it's traditional to offer the voter an opportunity to look at the results generated thus far. 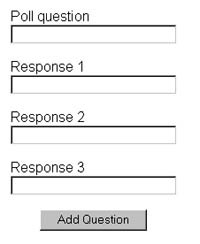 For purposes of this tutorial, I'll assume that each poll consists of a single question, with three possible responses. So far as the results are concerned, it's quite easy to provide a tabular report of the votes for each possible option. However, I plan to make the application look more professional by providing a graphical report, in the form of a bar graph. This might seem difficult to do, since the graph would need to be dynamically generated depending on the votes, but PHP's image generation functions make it a snap. A quick review of the various Web portals suggests that most of them also allow visitors to view the results of previous polls (this is particularly useful if the poll question changes on a daily basis). This is not too difficult to do - so let's add that to the feature list as well. With this skeleton in mind, the next step is to design a database that supports these requirements. This is a good time for you to download the source code, so that you can refer to it throughout this tutorial (you will need a Web server capable of running PHP and a mySQL database in order to run the application). After spending an hour looking out the window and another hour at lunch (hey, these are billable hours! ), this is the database structure I came up with. With the database taken care of, it's time to put together the Web pages that the user sees. The first of these is "start.php", which connects to the database to get the latest poll, and displays it with a list of possible responses. Pay special attention to the SQL query I'm running - I'm using the ORDER BY, DESC and LIMIT keywords to ensure that I get the latest record (read: question) from the database. Once the query returns a result, the list() function is used to walk through the result set and assign each field to a variable; these are then displayed in a form. The identifier for the poll question is also included in the form, as a hidden field; when the form is submitted, this identifier will be used to ensure that the correct record is updated. If the database is empty, an error message is displayed. In this case, I've already inserted one question into the database, so you won't see it at all; however, it's good programming practice to ensure that all eventualities are accounted for, even the ones that don't occur that often. and, assuming that all is well, updates the database to reflect the new vote and displays an appropriate message. // code to display results - keep reading! As you can see, the value of the $response variable is used to determine which option field is updated with the user's vote. Once the database has been updated with the vote, it's a good idea to display the current results of the poll. This involves connecting to the database, using the $id variable to extract the correct record, calculate the total number of votes, and the percentage each option has of the total, and displaying this information in a table. // also display an image graph - more on this later! You need to be careful when converting the absolute numbers into percentages - if there aren't any votes yet, you can get some pretty strange "division by zero" errors. This error is not likely at this stage - after all, you've just added a vote - but it can crop up at a later stage. As we progress, you'll see the correction I've used to account for this situation. The code snippet above references an image named "graph.php". If you're familiar with PHP's image generation function, you'll immediately divine that this is the PHP script used to dynamically generate the bar graph. I'll be discussing this a little later, so ignore it for the moment. Feed fixDate() a date in the default MySQL format (say, "2001-03-07") and it will return something much friendlier ("7 Mar 2001"). So that takes care of the mechanics of displaying a question, registering votes, and displaying totals. The next item to address is the stated requirement to be able to view previous polls. In this application, the script to accomplish this is called "archive.php". In this case, I've checked that the total number of votes is greater than zero before calculating percentages, to avoid "division by zero" errors - this is the correction I mentioned a few pages back. There's one more thing I'd like to do before leaving "archive.php" - modify it so that, in addition to displaying a complete list of previous polls and results, it also has the capability to display the results of any single, specified poll. This comes in handy on my first page, since it allows me to offer my users a couple of additional options before they cast their vote. If "archive.php" is called without any parameters, it should display the complete archive; if called with a specific $id identifier, it should only display results for that specific poll question. Both "archive.php" and "vote.php" rely on a dynamically-generated bar graph to spiff up the page design. And this dynamically-generated graph is created through the magic of PHP's image generation functions, as embodied in the file "graph.php". The first few lines are familiar - the conversion of absolute numbers into percentages. The length of each empty bar in the image above is 200 pixels (100%). Now, based on the percentage values already generated, "graph.php" will fill each bar with a specified colour; the length of the fill is determined by the quantum of votes. 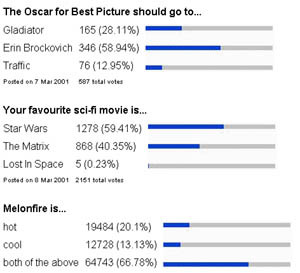 For example, if a specific option receives 25% of the votes, the fill will be 50 pixels long (25% of 200). Once the bars are filled, the image is sent to the browser for display. In case this didn't make any sense, you should take a look at the article entitled "Image Generation With PHP" at http://www.devshed.com/Server_Side/PHP/ImageGeneration/. And after you're done with that, come back here and experiment with displaying poll results in the form of a pie chart, rather than a bar graph. Go on - it isn't nearly as hard as it looks! The way things are currently set up, a single user can vote for a specific option than once, thereby contravening one of the basic principles of democracy: one citizen, one vote. Not many users would have the patience or inclination to do this; however, it is a hole, and should be plugged. Now, on each subsequent vote attempt, the script will first check for the presence of the cookie and, if it exists, the value of the cookie variable $lastpoll. Only if the cookie is absent (indicating that this is a first-time voter) or the value of $lastpoll is different from the identifier for the current poll question (indicating that the user has voted previously, but in response to a different question) will the vote be accepted. This is by no means foolproof - any reasonably adept user can delete the cookie from the client's cache and vote more than once - but it does perhaps offer an additional layer of security to the process. The ideal method, of course, is to track voters on the server itself, and deny votes to those who have already voted - and indeed, this is a feasible alternative if a site requires users to register with unique usernames before accessing its online polls. This script, named "add.php", is divided into two sections. The initial section is the form itself, with fields for the question and possible responses. Once the form has been submitted, the data from the form fields is assimilated into an SQL query and INSERTed into the database. And that's about it. Hopefully, this exercise gave you some insight into how PHP can be used to build a simple Web application, and illustrated its power and flexibility as a rapid development tool for the Web medium. You can use the example scripts above to build your own simple poll, or even modify them a little bit and create an online quiz (it is the same basic principle - one question, three answers). Either way, have fun...and stay healthy! Note: All examples in this article have been tested on Linux/i586 with Apache 1.3.14 and PHP 4.0. Examples are illustrative only, and are not meant for a production environment. YMMV!